We are continuously trying to improve your experience with Spotzi as part of our commitment to deliver the best Location Intelligence Tools. 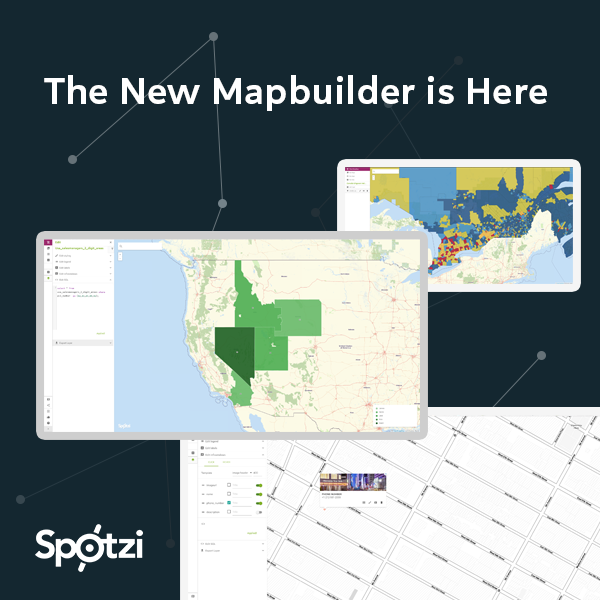 We would therefore like to introduce to you the final release of Mapbuilder 3.0. Next to a brand new user interface it is a complete powerhouse on the backend! A significant change that you’ll notice is an increase in speed and performance while using the Mapbuilder. Today we transferred all Free and Basic accounts to the new Mapbuilder. Premium and Professional accounts will be transferred during the next two months. If you are a Premium or Professional user and you haven’t received an e-mail please let us know. If you are not using our Mapbuilder we invite you to try our free plan. As 80% of all data within your company contains a location we are confident we are able to offer you valuable insights into your location data with our Mapbuilder and our Datashop. If you have any questions or you need any assistance please contact us at support@spotzi.com and we’ll be happy to help. As an extra bonus we can assist you in English, French, German and Dutch! Go to the new Mapbuilder! Each month we will highlight an interesting map. This month we show you the map with the purchasing power map of Canada.